Pickup trucks helped start the boost in off-road capable vehicles. The early Jeeps used in the 1940s introduced the U.S. to what could be possible. Buying a truck transfer case is easy when you know the facts. You have to determine the year of your vehicle. This provides your research foundation. Automakers have produced more than one case type. The year is what sets one type apart from others. All pickup truck case assemblies represented here are ready for sale. 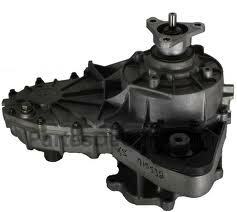 There are several top manufacturers of transfer cases. New Venture, New Process and Borg Warner have produced the majority of what is used in vehicles. There are other companies too. Knowing the year of your case will lead you to locating the case manufacturer. Each code is marked either NV, NP or BW. This is the common parts code for a transfer case for a truck. It’s OK to buy used. The mileage does play a role in the quality. What is essential is the internal parts. These chains, couplers, gears and springs could prove the quality of any unit. Proper lubrication is needed for a used case assembly. What you’ll find here is just that. Each case is tested upon arrival. OEM transfer case fluid is used to test compression. These tests reveal that a case can function without problems. Buying used transfer cases is a big help. These are reduced in price compared with brand new editions. We carry preowned replacements for Ford, Chevy, Dodge, Jeep and other U.S. brands. The imported units that are found here are often requested by 4×4 owners. It’s really hard to find replacement imported parts. We offer two varieties. These are used and reconditioned. We let customers take their pick. The price is not that different. What is different is the guarantee on parts. New parts that are added are created to last longer. Limited warranties are given for truck case assemblies although parts can fail that are not covered. Explore our pricing. Use our quote system. This is developed to be fast. You won’t waste your precious time. In just one click you’ll know your price. The good thing is there is no limit on requests. You can put in as many as you want. Let our quote system do the work. You review our price and call us to order. It’s easy for you. You can call and ask questions too. We’re here to help you. We know about fluid changes, gear slippage and other issues. Call us before you buy. We’ll help you out. Get your 4×4 back in order right now.